The cast of Legally Blonde The Musical. Photo by John Cholod. Oh my god, you guys. 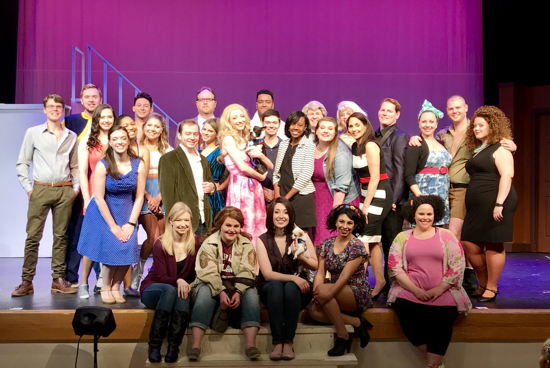 “Legally Blonde The Musical,” directed by TJ Lukacsina and presented by Silhouette Stages, is just so totally amazing. The story of a co-ed who makes her way from sorority life in California to the hallowed halls of Harvard will have you laughing, smiling, and believing that anything is possible. The musical has the same story line as the movie. Elle Woods (Lindsey Landry), President of the Delta Nu sorority, is planning a big night – the night her boyfriend, Warner Huntington III (Stephen Foreman), will propose to her. But life doesn’t always work out as planned. When she gets to the restaurant, Warner breaks up with her, telling Elle she’s just ‘not serious enough.’ (He needs a Jackie, not a Marilyn.) Elle vows to show Warner she’s serious and applies to Harvard Law School (‘like it’s hard?’). Admissions is impressed by her big song-and-dance application and think she’ll add ‘diversity’ to the student population. However, when she gets to campus, she discovers Warner already has a new girlfriend, Vivienne Kensington (Allison Bradbury), and Harvard is more challenging than she ever imagined. This feel-good musical is so much fun, it’s impossible not to smile and enjoy. With the help of recent law graduate Emmett Forest (Matt Wetzel), she gets back on track with her studying and even manages to obtain one of the four coveted internships with Professor Callahan (Ryan Geiger). When she and the other interns are presented with a high-profile case involving fitness guru Brooke Wyndham (Summer Hill), will Elle have the insight and knowledge it takes to win the case? This musical is just so much fun. After all, much of the musical involves an energetic group of sorority girls who love nothing more than to cheerlead and party. In the opening number, “Omigod You Guys,” the sorority girls come in on their cell phones, have a candlelight ceremony celebrating Warner’s impending marriage proposal, and help Elle select a dress at the mall. In “What You Want,” the girls deliver Elle’s personal essay as cheerleaders and end up dancing in a conga line with Harvard admissions. Elle makes sure admissions know that ‘what they want is right in front of them,’ showing her confidence and her own attempts at legal jargon. Landry was born to play the part of Elle. She’s the perfect blend of sweet and bubbly with just a bit of sass. Plus, she looks great in pink. Landry has great energy on stage and manages to appear both confident and unshaken (like when she meets Warner’s new girlfriend) and vulnerable (like when she realizes she’s failing out of Harvard). I’m also impressed with her dancing ability — even in those really high heels. Geiger is arrogant and ruthless as Professor Callahan. He makes us believe that being a lawyer is a total waste of time unless you acquire a ‘taste for blood in the water.’ And we can’t help but hate him when he hits on Elle later in the show. Bradbury is haughty and serious as Warner’s new girlfriend, Vivienne. Within moments of meeting Elle, she tells Professor Callahan that Elle should be thrown out of class for not reading the assignment. However, it’s also nice to discover her softer side when she realizes that women in the legal field need to stick together. Michele D. Vicino-Coleman adds humor as Paulette, a stylist at the salon Elle frequents. In “Ireland,” she tells Elle she has a thing for Irish guys and always thought she’d get married in Ireland at a wedding like Lord of the Rings. Later on, she keeps us laughing as she eyes the new UPS guy and proceeds to ‘bend and snap’ too quickly, breaking the guy’s nose. Vicino-Coleman has a natural sense of humor and a strong voice. Wetzel is sweet and unassuming as Emmett. He and Elle have an easy friendship, even shopping together for a new suit at a department store. As Elle states, ‘books with tattered covers stay on the shelves.’ The new suit must give Emmett a new-found confidence since he becomes a star when cross-examining during the proceedings against Brooke Wyndham. Somewhere amid all that pink, there’s a message in “Legally Blonde.” Don’t judge a book by its cover, especially when that cover looks like a Malibu Barbie. Elle proves she can be a good lawyer, and in the end, she can forget Warner Huntington III and just be herself. This feel-good musical is so much fun, it’s impossible not to smile and enjoy. Running Time: 2 1/2 hours with one intermission. “Legally Blonde The Musical” plays through May 28, 2017, at Silhouette Stages at the Slayton House, in Wilde Lake Village Center, 10400 Cross Fox Lane, in Columbia, MD. For tickets, call the box office at (410) 637-5289, or purchase them online. Pamela Steinik left the warm Florida sun for Baltimore more than 10 years ago. She's always felt the battle between her creative and logical sides. By day, she crunches numbers as a financial analyst. By night, she plays mah jongg, goes to book clubs, and reviews books and theatre. After getting degrees in accounting and finance, Pamela lived in London for five years and was able to enjoy all that London theatre has to offer. She's always been a big fan of musicals and is excited to pass that love on to her three children.